Creating and running an effective online business is realistically comprised of several hundred, rather than 6, but this will serve as a guide for the direction of your efforts. Contrary to what you may hear rampantly on the Internet, there is no cookie-cutter, get-rich-quick scheme on the web. Not only is every online business different, what works for one person or in one month may not work for another person or in the next month. The Internet is constantly changing, and the online market is inherently different this year than it was last year. New technological improvements occur monthly and impact the online business environment. What works for one individual when he is the first to sell a certain product a certain way may not work just six months later when he has sold his idea to 40,000 other marketers, and they all begin to promote it. Traffic generation tactics are significantly different than they were just a year ago and hardly resemble profitable strategies three years ago. These 6 Steps are simply the bare-bones skeleton of what has to happen for your online business to be successful. They are foundational, and although the implementation strategies are different today than several years ago, the basic steps remain the same. 1. Develop or discover a product. You must find a product that meets today’s needs. A 5-year-old product whose resell rights you can buy for a dollar or get for free probably won’t meet the needs of today’s consumers. You must be willing to pay for the rights to sell a current, useful product, or become an affiliate marketer, where you promote a popular product, and in exchange are paid a percentage of the income from the sale. 2. Determine how potential customers can view your product and see a sales presentation. If you develop your own product or purchase the rights to sell someone else’s, you will need a website. A few tips here: Rather than accept free web hosting, purchase your own domain name and pay to have your domain name and website hosted by a professional web hosting company Such As NairaLearn with a reputable history. 3. Once you have your website up and running, unless you are using an affiliate program that supplies a sales page, you must develop a sales script and web copy. Aside from your web hosting decision, this is probably the most important thing you can do. You may be tempted at first to write a sales pitch on your own, but unless you already have a lot of experience in the offline market writing effective sales letters, you need to, absolutely must, invest in a few courses on web copywriting. Be willing to spend some money upfront on learning this skill. Too many marketers try to wing it in this area and after a few months of losing money online, finally, break down and purchase the knowledge to write a good sales pitch. Do it the other way around—buy the knowledge first, and start making sales from the beginning. Customers will not buy just because you have a website—they buy from the website that does the best job of convincing them it has the best product for their need. You may be able to skimp in the traffic arena for a while if you have plenty of time. If you do not have money to advertise, nor time to seek out low-cost advertising, you probably shouldn’t be attempting an online business. If you do choose to go the low-cost route—know two things up front—the returns are really low and you will spend vast amounts of time on traffic generation. You are sure to fail. Good sources of low-cost, but time-consuming traffic are: writing articles and posting them to article directories, low-cost classified ads, and featured article ads. You may see hyped-up ads for thousands or visitors for a low cost or millions of banner ads for another reasonable price—both of these methods may have worked 2 years ago, but they are a sure waste today. 5. Once you begin to get traffic to your online business site, you must keep detailed records of where the traffic comes from, and what percentage of visitors from each source are purchasing your product. If you have visitors that cost you $50 per hundred to come to your website, but on average they only purchase $25 per hundred visitors, the income may feel good, but you are not profitable and are losing money. By tracking your expenses on each type of visitor and by tracking your revenue on the same sources of visitors, you can determine which campaigns need changes or need to be eliminated and which need to be increased in intensity. 6. By following this pattern of steps, and by keeping diligent records (there is plenty of good website tracking software on the market that can help you do that), you can develop a profitable online business. Again, it will not happen overnight, and you will not get rich quick. However, if you build a solid online business with a solid foundation, and are willing to spend some money learning how to do it right, you really can become successful in business online. 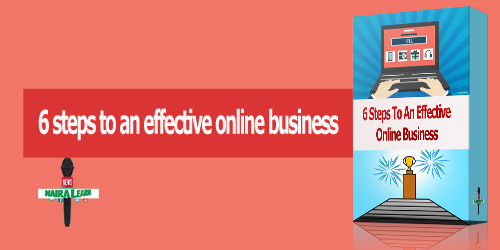 1 responses on "6 STEPS TO AN EFFECTIVE ONLINE BUSINESS"